Anne Marie Messer sits with her newly adopted black lab, Bella, at her Bangor home on Wednesday, Nov. 23, 2011. Messer adopted her dog from a shelter in Georgia. 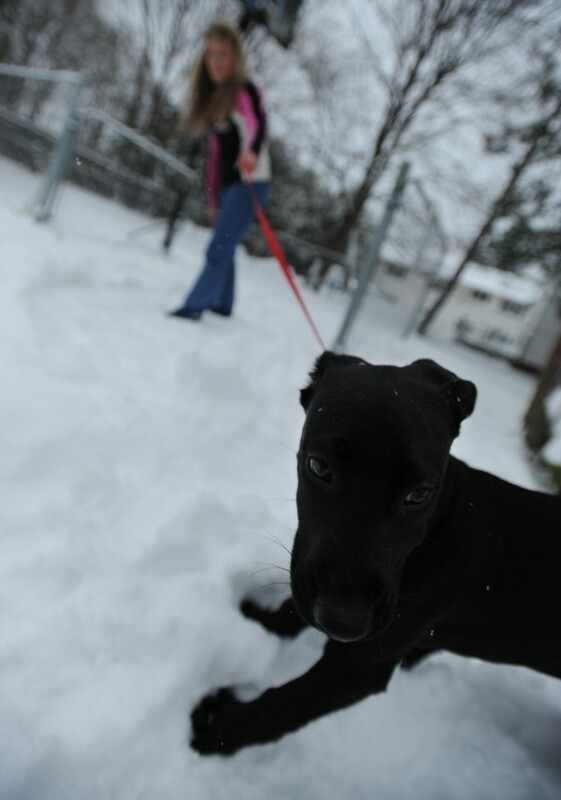 Anne Marie Messer tries to coax her newly adopted black lab, Bella, outside into the snow to pee at her Bangor home on Wednesday, Nov. 23, 2011. Messer adopted her dog from a shelter in Georgia. Bella had not seen snow before. ELLSWORTH, Maine — The state’s top veterinarian is urging Mainers adopting dogs “rescued” from overcrowded shelters in other states to educate themselves and ask questions to avoid organizations that skirt rules meant to protect consumers and pets. Each year, organizations that arrange animal adoptions transfer hundreds of dogs to Maine from animal shelters in other states, where they face possible euthanasia due to overcrowding or lack of demand locally. Maine state veterinarian Don Hoenig said many of those rescue organizations received permits from the state to bring dogs into Maine and comply with policies intended to reduce the risk of dogs carrying serious infectious diseases into the state. But Hoenig said not all groups or individuals importing dogs are following the rules. “A number of these dogs end up arriving sick or becoming sick shortly thereafter, causing a tremendous amount of stress to the people who have adopted these animals,” Hoenig said. As a result, Hoenig is cautioning those searching for a new furry friend to do their homework before accepting a dog or other animal from an unknown entity. Interstate animal rescues exploded in popularity following Hurricane Katrina as shelters in stricken areas were overwhelmed with animals that had been abandoned, displaced or whose owners could no longer care for them. Many rescue organizations in Maine now have well-established relationships with specific shelters often located in southern states where spaying and neutering is not as widely practiced. But some of those states also have more lax animal vaccination policies than Maine, and that is where the Maine Department of Agriculture gets concerned. “We don’t need to be bringing in diseases that we have just about gotten rid of in this state, such as distemper and parvo,” Hoenig said. Hoenig had been contemplating an embargo on rescue animal importations in order to address the issue, but instead opted for a public educational campaign after discussing his concerns recently with members of the Maine Federation of Humane Societies. There currently are 27 canine rescue organizations that hold a valid permit from the Maine Department of Agriculture’s Division of Animal and Plant Health plus another 27 organizations with expired permits. Hoenig’s office recently sent notices to the organizations whose permits have lapsed, instructing that they must be renewed if they are still active. In the meantime, Hoenig is hoping to post a list of the permitted organizations on the department’s website by next week. Animal rescue groups that follow the rules agree that unpermitted organizations are a problem. Some of those dogs arrived with diseases that were costly to treat — not to mention contagious to other dogs — while others had behavioral issues, Dostie said. By contrast, Dostie said the rescue animals that Greater Androscoggin Humane Society coordinates with an Alabama shelter are often healthier than the local dogs that arrive at his shelter because they must be vaccinated and were checked for illnesses. Anne Marie Messer of Bangor is among the hundreds of Mainers each year who choose to rescue an out-of-state dog. In November, Messer and her husband, Dave, adopted a 14-week-old black Lab mix named Bella from a shelter in Georgia. The adoption was done through Star Bright Animal Rescue, a group with a volunteer network in New Hampshire and Maine that the couple found online. The Messers have owned several Labs in the past and decided they wanted to give another dog facing possible euthanasia a chance at life. The family paid Star Bright Animal Rescue $375 for Bella, who came with all of the necessary paperwork showing she had received the proper vaccinations and been checked out by a veterinarian. Speaking last week, Anne Marie Messer said her family was so pleased with the experience they are considering adopting another rescue dog next year as a companion for Bella. Although many rescued animals are being saved from overcrowded shelters, adopting those animals is not typically free. Organizations often charge several hundred dollars to cover the costs of vaccinations, veterinary check-ups and transporting the animal to Maine. Bonnie Martinolich, whose South Portland-based organization Almost Home Rescue has helped coordinate roughly 3,000 rescues in Maine since 2005, said if she personally knew which groups were not following the letter of the law she would report them. But the problem is such groups often operate on the Internet or out of the back of a van. Nor does Martinolich believe that establishing stricter rules or placing an embargo on bringing rescue dogs into Maine are solutions. “Making the rules tighter is probably not going to make those who are not complying comply,” said Martinolich, whose all-volunteer organization works with four partner shelters in southern states. Cheri Martin, a volunteer who coordinates adoptions through Star Bright Animal Rescue from her Glenburn home, said the first question she asks potential adopters is whether they have looked for a dog locally. If they have been unable to find a dog they want locally or are eager to rescue one, Martin or others with Star Bright will begin the adoption process. Martin said Star Bright holds the dogs for longer than required, does additional tests and uses a transport company licensed by the U.S. Department of Agriculture. Despite the state’s precautions, adopting dogs rescued from other states still has risks. Dr. David Cloutier, who works at Veazie Veterinary Clinic, pointed out that heartworm often doesn’t show up in diagnostic tests for up to six months after infection. In the meantime, mosquitoes can carry heartworm larvae from one dog to the next. Even more troubling to Cloutier is a drug-resistant strain of heartworm emerging in some southern states along the Mississippi River. For that reason, Cloutier said individuals adopting rescue dogs should find out exactly when the animal last had a heartworm test as well as when it arrived in Maine. And if there are already dogs in the household, the adopting family should ask their veterinarian to place that animal on a preventative care regimen to avoid heartworm transmission, just in case, Cloutier said. Hoenig, the state’s top veterinarian, said rescue organizations are required to provide the adopting individuals with a health record for the dog. Adopters can also ask to see a copy of the organization’s permits as well as health certificates from previous adoptions, he said. The department can use court injunctions to stop unpermitted groups from bringing dogs into Maine, but will first attempt to convince the organizations to come into compliance, Hoenig said. In the meantime, the department is stepping up its public education campaign rather than go the more Draconian route of imposing a moratorium or embargo on dog importations. “Right now, we are making a renewed effort to get the public to realize that there are legitimate animal rescue organizations out there who are following all of our rules and are doing it right,” Hoenig said.